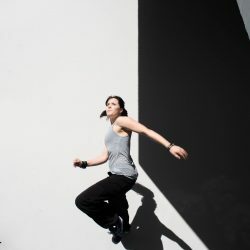 Kasturi Torchia co-founded Esprit Concrete with Gogoly Yao in 2016, it aims to aid individuals gain a deeper understanding of their emotional, psychological and physical states through movement and self-reflection based on an Art Du Deplacement and Parkour experience. Julie Angel talks to Kasturi about this unique project and approach. J.A. 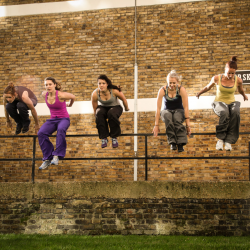 : Can you tell us a little bit about the how, when and where you first discovered Parkour. K. T. : So, a friend of mine Owen who was on my DCounPsy course with me 3 years ago told me that he had seen something that I may take to. It was free as a London Metropolitan University student and I was looking for something…. I don’t know what but I was searching for a feeling inside me, something stirring. So, liking the unknown and being very curious as a person in all things generally, I gave it a go. Gogoly Yao was energy personified and laziness embodied all in one but he moved with conviction and grace and also a really evident fear and hesitation all in one – it was tantalising. That class I did a “passer de chat” without knowing that it had a name, and that feeling I had been searching moved me more deeply than anything I had ever done before. I decided there and then – I would do this forever in some measure. J.A. : How have all your backgrounds and influences come together to meet Parkour? K.T. : I come from a nomadic family. We moved every year and a half growing up and learning to adapt and accept the strangest of situations as learning opportunities rather than insurmountable hurdles, was instilled in me at a young age from my parents. As the eldest sister of 4, I was taught responsibility, its burdens and its rewards from the go, and my parents made sure that they groomed conscientiousness and vigilance in me from a very moral and human point of view even as a child. I was always encouraged to think, reflect, challenge and re-evaluate no matter who I engaged with, often engaging me in very long philosophical debates at the age of 5 even! But….. they did not always practice what they preached and I realised fast that what they taught me, was for me, to give me a strong foundation to avoid all they could not and to in many ways, be the strength they wanted to be themselves but had not been supported in developing. So I learned hypocrisy and the idea of honesty with myself and others, truth and its very many sides and complexities and above all the necessity not to follow without question. If others were not doing what they knew was right, use this to motivate me further to try to do it myself to then teach them to try as I did every day. 25 years later, this led me to Psychology and its practice/research. Doing my Doctorate and questioning my current path, I had just come back from South Africa, my first holiday in 3 years and I was invigorated with life and yearning to see what more to me there was – although I had been “the responsible one” growing up, I had a flare and passion in me, a defiance and a uncontrolled liberation seeking energy within me that till now I had suppressed. I found Parkour and in that moment it exposed to me a strength and courage in me I didn’t even know I had. I got divorced, left my stable life behind and took a risk. I chose to explore another side of me kept hidden for a long time for many reasons and I realised – parkour and later more precisely I learnt, Art Du Deplacement, its practice and philosophies, was home for me. J.A. : Can you tell me about Esprit Concrete – what it is and the goals and philosophy behind it. K.T. : Yao and I spend night after night roaming the streets of London in deep discussion about the power of ADD/Parkour and psychology but more specifically Counselling Psychology. The humanistic underpinnings that counselling psychology and ADD shared was so obvious to us both. We began to unpick and unravel our process through training but also identifying how we as people would change and grow, but also change and break through our love and passion of the discipline and using integrative theories of therapy, Yao and I began to formulate our own presentations more deeply, sourcing back to where things started on our journeys, to in turn inform how we were either productive or restrained in training, eventually using guided discovery techniques to start to make associations with our personalities, coping mechanisms, defences more deeply hidden, all to try to work through these using parkour. We began to seek and find honesty about our person to truly understand what our deepest fears were and when we realised that most of the time a physical fear in parkour training was actually an outward manifestation of an internal conflict we had, we decided to find a way to share our way of exploring ourselves to reduce feelings of inadequacy in the self and other and to enhance our movement more rapidly, due to tackling the deeper more core issues of our person, not just the physical hurdle that often becomes our “ brick wall” we are unable to surmount. At its core, esprit concrete became our way of combining the older methods of training by the Yamakasi, which advocated self-discovery to gain the ability to help one’s self and others, with Yao’s more modern understanding of the mechanics of the movements to guide us and others to explore their psychological strengths and weaknesses to unlock a more authentic and genuine sense of self, to then give back to the community around us. J.A. : What was the inspiration for the project? K.T. : All our feelings during training inspired us to question. All mental blocks pushed me to question. All feedback from friends, family, colleagues about subtle changes they observed in us motivated us to keep on questioning. And then the concept of competition came in to it….. It may seem strange but, for us, the process of competition and the pressures we felt from it both externally driven and internally, led us to wonder “why are we doing this” “what are we striving for”. The more I trained, the higher the expectation I placed on myself became. The more expectation the steeper the sense of failure I felt, the more failure I perceived the more vulnerable and susceptible to injury I became. Within the first year and a half of training the more I realised that this beautiful thing I had found and experienced was darkening and losing its sparkle. It was becoming a stress – and why? – me me me. My perceptions of the world and their view of me, my perfectionist traits fuelling stressors, my comparison of myself to others constantly ….. and above all – my disgust at myself with the amount of competitiveness I was feeling with myself and others and my anger at my inability to control this was facilitating the drift between me and the art form I had come to love. I was not happy with who I was – yes I could jump stuff and dive stuff and swing stuff and climb stuff and I was getting stronger by the day but my mind was weak, suggestible and misguided. So……..As Yao was experiencing many similar things in his own way, we began to differentiate more and more the effect that external trends and influences had on our training, seemingly urging us to be better, stronger, faster all right now as if ushered on by the same impatience and instant gratification style environment city life and a busy career can simulate, with the more long term, training for life, mindful, transparent and internally satisfying influences. This led me to train with Yann Hnautra, Father of the heart and soul of ADD as I call him, and he helped to validate what I felt, see in me something he wanted to be a part of mentoring, and encouraged me to look more closely at consolidating a working model to investigating and manipulating the psychological aspects of an otherwise very physical practice. J.A. : Who is involved? K.T. 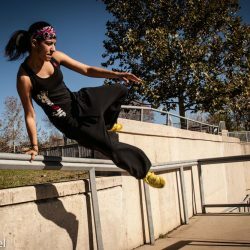 : Yao leads the coaching from the physical side given his breadth of experience teaching parkour for the last 10 years. He trains the team and I individually mentor our progress as well as planning and organising team trainings and open team trainings where the community get to train with us our way. I do my bit of balancing the movement with psychological themes for classes, guiding students on their journey of self-development, whatever their goals may be, supervision and training of coaches and researching our cohorts where applicable. Georgia assists classes and occasionally will run a workshop abroad in we cannot go as a team. The Yamakasi namely Chau, Yann, Laurent and William’s along with their respective families support us in a multitude of ways and their ADD Academies and teams including people like Mehdi, Nabil, and Francois all help us with moral support, structural support and huge brainstorming sessions for the future. Our families – EVERYONE- plays a huge part in our decision making and our promotion. They give time and effort in every aspect of our lives and esprit concrete is a very family run business in essence and without us sounding out all our crazy ideas over many dinners, we may not have had the courage to even start! Our friends in all other parkour ADD communities, groups and crews have supported us to no end and the give and take relationships we continue to form are the only reason we survived our first year. They trust us and we them and we hope only to be able to count on them if and when we ever step out of line in any way as we truly rely on them to help keep our motivations high and our values true! J.A. : What are the different programs Esprit Concrete is currently involved in? K.T. : We are still very young and we are taking this year and the next to form a strong network of collaborations first and foremost with organisations and governing bodies across many disciplines that are in alignment with our values, practices and aspirations. In line with this, I am grateful that I get to sit on the Mental Health Action Group for Parkour UK along with Charlotte Blake who is my sounding board at times for things mental health and sport related, and Eugene Minogue, who is my go to man for anything and everything when it comes to company legislation, good practice and networking for mental health and otherwise and Scott Jackson who is always around. I would be lost without their guidance for many things. We currently run drop in weekly classes for adult and young people, school clubs as well as school time sessions, personal development courses for women and parkour for mental health groups for our collaborators Free Your Instinct. We also do a lot of community initiatives that include free workshops and demos for different boroughs all over London to encourage people to get active, normalise all that is mental health related and grow our presence in the community to enable us to gain the communities trust and enable us to begin to role model and share the ADD values of family and unity within these communities. In addition, we run special classes for young people in schools who are said to have behavioural, emotional and psychological difficulties. We also run a therapy service that enables clients to not only physically but also psychologically irrespective of what parkour movement path they take. To make this accessible to all, we offer a heavily subsidised scheme for people seeing me for therapy 1:1 and furthering the areas they are focussing on through our parkour sessions as well, but do also see people who only want therapeutic services absent the parkour. We are also working on research affiliated with London Metropolitan University and other funding bodies such as Sportivate in the hope that more psychological parkour data will be made available and grow the interest in the approach we are trying to put forward and develop. We are working with CRISIS for homelessness under Petria Aylen’s guidance and with the ADD Parkinson’s Psychology Project that is now co run with Mareike Schwed. 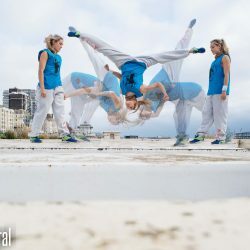 We will also be delivering workshops in Wandsworth in collaboration Flora Herberich as part of a community project funded by the Wandsworth Arts Fund, performing with our performance team GRIT at the Wandsworth Fringe Festival in May. In 2018 we hope that we are successful in creating alliances that we will also hopefully learn a lot from as well as continuing to work in schools and with various charities. We also run many workshops all over Europe thanks to the curiosity of practitioners in the community and have already travelled more than we would ever have dreamed to – thank you all! J.A. 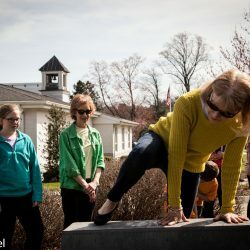 : What challenges do you see the Esprit Concrete overcoming in terms of making Parkour accessible? K.T. : For me, where there are people working together to overcome prejudice and fear driven decision-making in the world, there is always a way forward in making initiatives accessible. Many individuals in the UK have dedicated years to ensuring that we have a voice as an ADD/Parkour community and that we are held to the standards that we set upon others. So – in terms of challenges – we hope to keep our rates as affordable and reasonable as possible, for if we could live off a free service we would– and……..yes fear of the unknown will always exist so we hope to provide opportunity for experience and exposure to our ways. The more we bring our philosophy to those folk who are unsure, the more we make them see that there is no us versus them but just an “us” as a singular, a common goal, the more accepted we can hope to be. Exposure is key and that is why for us trials are free. We believe that talking and doing are worlds apart so we invite people to experience first and talk later. That way if it is in line with that person, great and if not, because we are interested in the development of that person acknowledging we are all different, then we are well informed enough to refer them on to a service more in line with their aims and wishes. We are not a one size fits all and with that comes a level of flexibility and adaptability and an expectation on resistance and objection, so we stay well researched and ensure that when approached with this we can assess and guide that person to something that will benefit them more than we can. J.A. 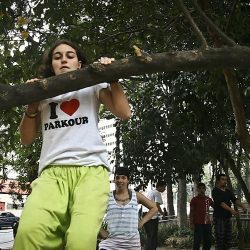 : Can you tell me about your approach to sharing parkour, play and challenges. How does this fit in with the Parkour projects you are running and mental health in particular? K.T. : Parkour, play and challenges for us are our behavioural experiments and our bread and butter of tools used to convey all we hope to. The group dynamics, individual exploration, social and political, moral and legal implications of everything can be mapped to the games and tasks we set in class. We use every game and exercise to map it to a real life situation a trial of real emotional consequence to the person playing, so that they can better believe in their ability to cope, manage and at times solve whatever they may encounter in day to day life. So that they can train to be receptive, observant and infer from others, as well as introspective, reflective and deduce things about themselves. Our play is an analogy of life – yes of course it is also facilitating fun, creativity, risk management, planning, physicality and above all joy! But for us, I was inspired by an aspect the Danish perception of game playing which I studied at Gerlev Academy 2 years ago. The incredibly powerful developmental properties it can facilitate. Thoughtfulness and thoughtlessness. Pointfulness and pointlessness. Hierarchy and anarchy. All these opposing forces and constructs at work in a simple game of tag or “pull the peg” (Yao’s game which is a hit!). It is fascinating – at Esprit Concrete we say “everything is parkour training” – and by this we mean everything can be a lesson so we play, joke, challenge and provoke and then after a moment we reflect, ask for feedback and share an interpretation and a goal we may also have had in planning. We also then give individual feedback and points of thought/action to different members of the class depending on their own emotional, psychological and physical needs and prompts on how to use the task/game to squeeze this out of it. J.A. : How long has it taken to bring to fruition? K.T. : Not long at all! We are surprised to this day at how fast we started working. 2 months of only 1 class and then things began to come knocking at our door and we only hope and pray every day that if we keep working hard this stream of work will keep coming – keep your fingers crossed for us too! J.A. : What have been the main challenges you’ve had to overcome in bringing it all together? K.T. : Setting up a company and all that entails practically and emotionally – it was and is sometimes terrifying – I did not have a single clue!! Dealing with the overwhelming feelings at times that we are treading on pre-existing organisations toes – even though we are trying to do something we do not believe is being done like this and call out to all who feel they are, to join with them and work together . Not sleeping more than 3 hrs a night for long perisod of time. Being on my phone 100% more than I would like – HAHA! – but seriously, no – I wouldn’t change a thing – yes it is tough, I bring in 98% of all work coming to us at the moment while doing a Ph.D and placements for this and tutoring siblings and somehow still keeping my partner and friend happy, but I believe in what we are trying to do. I am more happy than tired and I know that I won’t be in the thick of it forever (I hope!! ;)) J.A. : What feedback have you had so far? K.T. 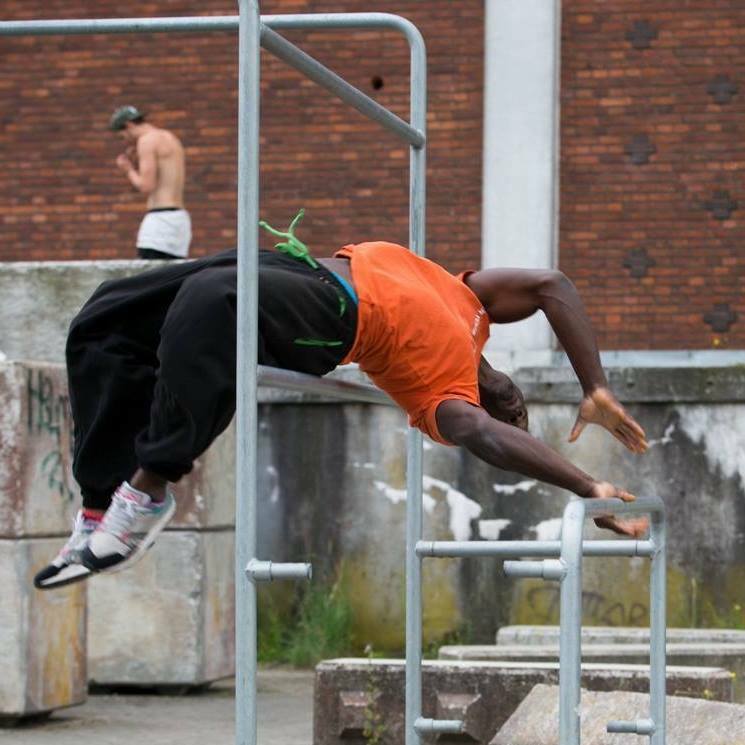 : We have figures for some courses but I do not really want to focus on that here – community feedback for me from service users and non-users from hearsay even, is that we emphasise the community values of ADD/Parkour in all that we do and for me that is the best feedback I could get. We do not want to ever be seen as the experts because although we do know that we have a lot to offer we would like to empower people to come train with us and leave us, fully able to train, nearly quit, question this, find a way through it and come out stronger each time so that we do not have a revolving door situation in our service. Of course the regular clientele we have is just fabulous, but especially for the more specialised services, the feedback we are getting is that what we teach is empowering people to apply what they learn through our movement classes to go on to try out the emotional and psychological techniques elsewhere, be it with relational issues, work trouble, exam prep, bullying, racism whatever. Our students say they feel challenged but supported, they say they trust us to not judge them and they say that they can show us the parts of themselves they are not too proud of and we embrace that and work on whatever they feel they would benefit from. They say that we guide them to find their parkour and reach out and learn to ask for support and help wherever and whenever they can and not to struggle alone. J.A. : What are your future plans and how can others learn from you? K.T. : I believe that just because come one may be the first person to do something as far as they know, it is not important that they be the last. What Esprit Concrete discovered, because I do not believe we are creating anything but rather re-discovering and perhaps combining things in a new way than what was done before, should be and will be shared. I hope people look at how we try to share ourselves first and foremost with others and then our work with Esprit Concrete so that more people will come together and share too without being too afraid of ownership of the thing they are doing. Recognition is of course very important, it is self-affirming and validating to us to be acknowledged for what we are trying to do , but we try to share with others knowledge and expertise to ensure that our clients’ needs are truly met to the best of our ability and if that means that we are not what they need or someone else we know does what they need better, then I hope that more parkour companies will encourage people to seek out their way and encourage people to find their approach independent of shackles of misplaced loyalty or ego driven agendas. I would like to be part of the future of collaboration using Esprit Concrete as an example of how this can be done and champion the humans around me who are also doing remarkable things. Network mentoring in my eyes is just SO empowering and so very under used. J.A. : How can people stay up to date with your projects and how can they contact you? K.T. : Our facebook is our main interface for communicating with the community and so anything happening with us is publicised there. We try to respond to any emails and messages left asap and feedback with this is good so far so please do not hesitate to call us. This included messages just about discussions and free training with us if you are in London and would like to meet us – we try to make ourselves as available as possible – bear with us as we are in our infancy, times are busy – but we will do our utmost to meet, greet and where we can , train with you all. TEL: (0044) 07908687599 EMAIL: espritconcrete@gmail,com FACEBOOK: https://www.facebook.com/espritconcrete/ WEBSITE: www.espritconcrete.com INSTAGRAM: @espritconcrete J.A. : Final comments, ideas and thoughts you’d like to share? K.T. : If you have any doubts about your ability to try parkour/ADD but are very interested in it, please think about one of our mottos and then see how you feel. No matter your age or gender or physical or psychological position. Try to think about practice being the key to progression and less about it being about perfection. Tell yourself that we all start at step 0, no matter what that step 0 may look like and we need to move to step 1 in order to know what we are capable of. Any predisposed idea of what you are capable of may be due to comparing yourself to the amazing things you have seen around you which is the product of years of experience so…. Take the first step which begins with the choice to try, and keep doing just that. Try, try and try again – and if you get tired of it, share the issue to halve and ask for help to resolve it. Just my own process and it helps me day in day out to grow trust enough in myself to take the risks I take.  J.A. : Thank you Kasturi! copyrightKasturiTorchia2018 All rights reserved.